take $5 off for each additional product purchased! If you're serious about writing well, throw away Microsoft Word®, because now there's Writer's Blocks. And it's more than just a word processor. It's an idea processor! ONLY $119 Always at least $10 less than anywhere else! Writer's Blocks is a powerful tool that will help you get your ideas out of your head and onto the page – fully organized, edited, and paginated – and do it faster and more concisely and clearly than ever before. By combining our acclaimed visual outliner – which uses blocks to capture, organize, outline, and structure your notes – with our innovative word processor, you can now use one tool from brainstorm to rewrite. Writers, novelists, authors, journalists, researchers, screenwriters, attorneys, students, and technical writers will be more productive with Writer's Blocks. Increased Productivity - Writer's Blocks lets you capture and arrange your ideas easier and faster than ever before. Create hundreds of blocks each containing a few sentences or a few pages of text. Arrange your blocks into a coherent structure and then transfer your outline into the integrated full-featured word processor and expound on your ideas. Each block remains linked to a section of your manuscript for quick and easy reference. Click on a block to automatically scroll the corresponding section of your manuscript into view. Better Organization - Writer's Blocks lets you store all of your notes and reference material all in one place, but unlike other programs, Writer�s Blocks keeps all of your blocks visible in the workspace for easy reference. Writer's Blocks provides you with a rich toolset that lets you capture ideas, notes, and other information, quickly and easily � and gain the full benefits of the power of association from the information you have gathered on-screen. Faster Outlining - Writer's Blocks lets you capture ideas at the speed of thought. And consolidating information from multiple sources is a snap with the Power Panel. Brainstorm to capture your ideas and information, then arrange them later. Because each block can hold several pages of text, the program will not limit you during any stage of developing your document. Better Structure - Editing your blocks is a breeze. Each block is like a tiny word processor document. When you are ready to structure your document, just drag and drop your blocks under up to 100 column headings that you define. Use the AutoArrange and AutoNumber features to keep your blocks in neat columns and rows as you flesh out your story. Document Overview - Writer's Blocks gives you the big picture. The bird's eye view of your data that you enjoy with Writer's Blocks will give you a completely new perspective on your work. You'll write better and faster than ever before! Integrated full-featured word processor lets you use Writer's Blocks from start to finish. Split Panel interface lets you view and edit your blocks and manuscript at the same time. Import and Export native Microsoft Word, RTF, HTML, and text documents. Convert an existing document to blocks and rearrange it, simply by rearranging your blocks. Float the Power Panel over your browser when collecting information from the web. Drag and drop text into the Power Panel to collect huge amounts of information on the fly, storing each note in a separate block. AutoType feature automatically completes any word that already exists anywhere in your document. No more creating word lists ahead of time. Use Blockmarks to navigate to the section of your manuscript that is associated with the selected block. Drag and drop text between blocks and any Windows program that supports drag and drop such as your Internet browser. AutoScript feature let's you format a screenplay with 'Tab and Enter' ease. We all know it is far more effective to organize a document's information before we actually begin to write. But programs that only display information in a linear fashion provide little support to the organization process. Writer's Blocks' unique design - part word processor, part spreadsheet - solves this dilemma. The program manages information in a series of sizable blocks that can be arranged in columns representing separate topics. When compared to traditional word processors, Writer's Blocks allows you to more quickly capture, visually organize, and evaluate far more information, both under a given category (down), and in different categories (across). Whether you write complex documents or just work with large amounts of related text information, Writer's Blocks will revolutionize the way you work! Simply put, a Writer's Block is a container that holds text. Each block can be used to enter an idea, scene, point, etc. Like using electronic note cards, Writers Blocks allows you to easily and efficiently manipulate ideas. Unlike ordinary paper note cards, Writers Blocks lets you easily edit, arrange, re-number, and print your blocks. Writer's Blocks will help you develop and organize your ideas faster than ever before. With Writer's Blocks you enter each point or idea in a separate Writer's Block. Arranging your blocks with drag and drop ease, you can quickly and easily organize your ideas into a coherent outline. While Writer's Blocks is powerful, its also very easy to use. Its intuitive and consistent interface means you'll be productive from the start. Whether you're writing an article, speech, or research paper, or a novel, screenplay, or stage play, you'll be more productive with Writers Blocks! Brainstorm in a free-form style then organize your ideas. Develop your structure by arranging your blocks under user defined column headings. Set Block font and color attributes for each block. Set the column attributes too. Edit the title and body for each block directly on the block or in the Power Editor. The Power Panel with its Power Editor and Power Tools allows a magnified view of the currently selected block for quick preview or editing, even if the block is not visible in the viewing area. View and edit your blocks in either the Block or Outline Modes. Print a "blue print" of your document. Export your outline to most popular word processors in standard ASCII format. Customize Writer's Blocks to fit your writing style. Set and save default title, font, and color preferences for blocks and columns. Whether you outline by the scene, page, or chapter Writer's Blocks can accommodate your personal style. Writer's Blocks for Windows is a unique writing tool that will help you organize ideas and information faster than ever before. Just enter each point or idea into our expandable, movable text blocks and off you go. You've put the awesome power of your computer behind the humble note card. Now you can quickly arrange and organize your blocks with drag and drop ease. Edit, link, sort, search, print and much more. These features will save you time and make you more productive. If you are familiar with any popular word processing program, you'll be an expert Writer's Blocks user in no time. Most users spend less than 15 minutes learning the major differences between Writer's Blocks and standard word processing programs. In addition to blocks and columns, you have many other organizational tools at your disposal. Name/number each block. Name each column. Choose the number of blocks in each column. Move blocks by point & click. View your work in a block or an outline format. Use different colors for certain blocks. Connect separated but related blocks using links and arrows. These features and many more means your information will be organized in no time. Whether the information source is your brain or an outside source, the ingenious Power Panel makes collecting information quicker than ever before. The Power Panel "floats" on top of either your open Writer's Blocks file, other program's files, or on top of the internet. By displaying your current information across the length of your screen like a word processor, the Power Panel eliminates the "cramped" feeling associated with typing into a block. Or quickly cut-and-paste information directly into blocks with fewer clicks, since both your source document (regardless of the program) and the Power Panel share your computer screen simultaneously. Accessing Your Information - You've got options. Easily export to your favorite word processing program, and each block appears as a separate paragraph, ready to be fine tuned into a finished document. Or print directly from Writer's Blocks. Printing options include either block or outline setting on 8 1/2 X 11 paper, or 3X5 cards in block setting. Helps organize even the most complex documents. 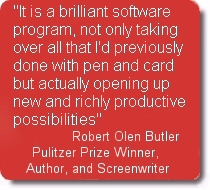 Many of our customers use the program to outline complete novels. While the program's total capacity is a function of both the number of blocks and the amount of text within each block, with Writer's Blocks you can create documents containing hundreds of blocks. Flexibility to Fit your Style. Our goal is not to change the way you write. Instead, Writer's Blocks is designed with flexibility so that it enhances your writing style. Writer's Blocks has hundreds of optional features that allow you to work and write your way. Increased Productivity - Writer's Blocks lets you capture and arrange your ideas easier and faster than ever before. Better Organization - Writer's Blocks lets you store all of your document's information in one place, but each piece of information is maintained in its own block for easy manipulation. All of your blocks are displayed in the document workspace for easy reference. Better Structure - Editing your blocks is a breeze. Each block is like a tiny word processor document. When you are ready to structure your document, just drag and drop your blocks under column heading that you define. Use the AutoArrange and AutoNumber features to keep your blocks in neat rows and columns as you flesh out your story. Document Overview - Writer's Blocks gives you the big picture. The bird's eye view of your data that you enjoy with Writer's Blocks will give you a completely new perspective on your work. You'll generate your research reports better and faster than ever before! Have questions about our software? Unsure what you need?